One thing SORELY missed about the 8-bit days is the compilation pack. It was a win-win situation for everybody. 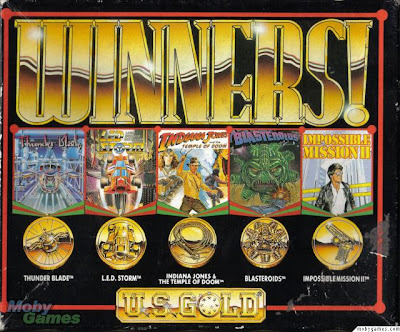 On the part of the software house, it meant that they could get yet more sales of some of their not-quite-so-brand-new games (after the initial rush of buying the game when it first came out had subsided), and on the part of Joe Public they got several games for the price of about 1 and a half. It was a no-brainer. Of course, software houses weren't daft. Many compilations consisted of a couple of good games bundled in with a couple of crap ones, but on occasion there were some real gems out there. Of course, on occasion software houses tried to sell compilations of simply terrible games to try and make some money out of them. You know, value in quantity and all that. 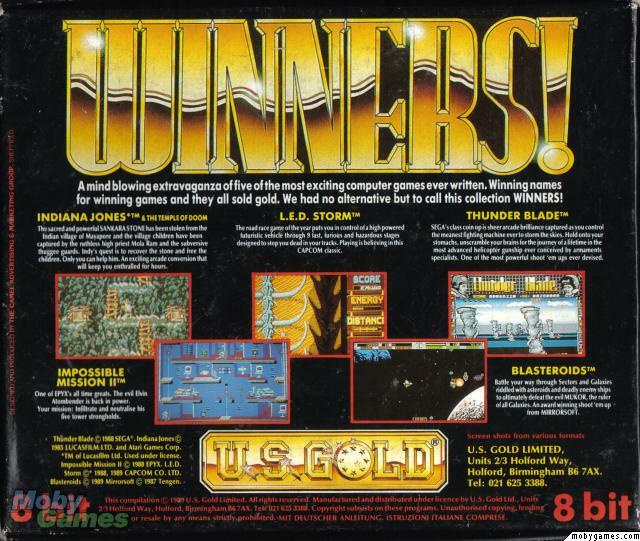 The first compilation I got my hands on was "Winners", and it was a typical mix of good and crap. So what joys await, then? Things get off to a bright start with a game I convinced myself was going to be crap, but actually turned out pretty good. 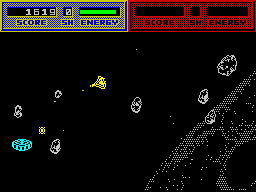 It's an Asteroids clone (you could have guessed that) with knobs on. But it's fast, frantic, and very very challenging, even on the "easier" paths. 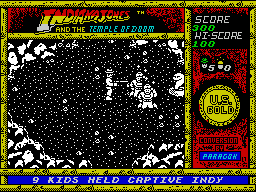 It's an arcade conversion, but regrettably I've never played that version. Just like all Asteroids-type games, you are surrounded by hurtling pieces of rock, which, when shot, break into smaller pieces, which, when shot, break into smaller still pieces, and you get the idea. Purple asteroids contain Energy Crystals, the sooner you collect these the more energy they restore. 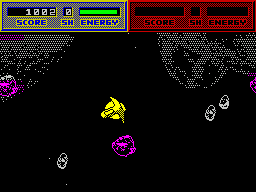 Some asteroids expand and then simply freeze when shot, and occasionally a nasty alien ship will start to open fire on you. Once the level is clear, fly to the warp to escape, and choose your next sector. After clearing enough sectors, you have to face Mukor, a green tentacled alien, whose tentacles you must destroy to defeat him. Your ship can be transformed into 3 different forms, a light, nippy effort with little firepower, a big heavy beast of a ship with additional armour, or a mid-size ship with the best firepower. Playing with 2 players allows you to "dock" your ships together, if one of you is the nippy thing, and the other is the beast, giving you one ship with a rotatable gun turret. 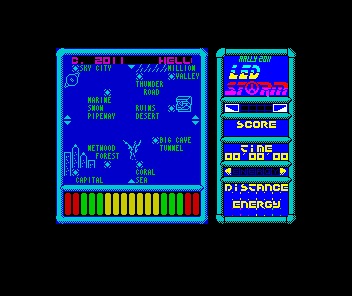 There's a host of power-ups on offer too... from the usual shields, extra fire power and invisibility, to the "Ripstar", which causes your ship to fire rapidly while spinning around. Colliding with enemies or asteroids is never a good idea, each hit reduces your shields if you have any available, or causes major loss to your energy banks. These are depleted just anyway by using your thrusters... so you have to keep on top of the energy crystals. Fast, challenging, enjoyable. Nice one. Now, THIS is a gem. And, I'm very happy to say, one I managed to complete. I was determined to do it, and when you play this game you'll see why. The evil Elvin Atombender, foiled in the first game, is out for revenge. Exactly what that entails, I'm not sure, but by the sound of his name, it probably involves Atomic death around the world on a grand scale. You play the part of an athletic (and very well animated) spy, wandering about the nooks and crannies of Elvin's tower block. Unfortunately, many deadly robots are also rambling around, attempting to stop you. To progress to the next tower, you must collect 3 numbers for the passcode to open the elevator, these are located inside various objects inside the main rooms in the towers, along with a couple of other useful tools. These can be activated from the computer terminals and include such delights as bombs, a snooze button for the robots (some are still deadly on contact though) and extra time. So, you collect these numbers to try and crack the code to progress, however that's not all... to actually reach Elvin's lair and defeat him entirely, you need to also collect a song. Snippets of the song are stored in safes, 1 in each tower. There's 8 towers, but only 6 snippets, so 2 are duplicates and must be recorded over. You can't just search a safe though, you need a time bomb to blow them open first. Things are never straightforward in the life of a spy. All in all, this is a HARD game, and will give you a lot of satisfaction if you manage to crack it. The crown jewel of this collection and no mistake. You may remember I reviewed the arcade version a little while back... and told you how great it was. But by the bloody hell, US Gold, or Paragon, what the hell were you playing at with the conversion??!? 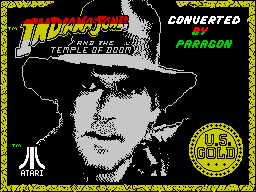 Even with the Spectrum's limitations, this could've... SHOULD'VE been a much better conversion than it ended up. Well, I did say there had to be a couple of duffers in there, right? The graphics are half-decent enough, sure, but why lose nearly half the available screen with that piggin' status bar and colourful border? The sound is awful, the framerate is awful, the collision detection makes the game borderline unplayable. But hey, you've had 2 top quality titles, it'd be greedy to expect a third, right? Just to top it off, I recently discovered that there is in fact an INTENDED GAME-BREAKING BUG in the game's code. Once you reach level 4, you're stuck as the level doesn't appear to have an exit... however, in the code itself, the game doesn't even bother checking to see if you've reached the exit on level 4, so this was clearly done with intent. Oh, hold on. Now we're talking. 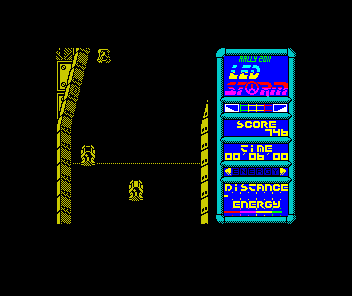 LED apparently stands for "Lazer Enhanced Destruction", but I don't remember seeing many lasers in this game. In fact, I don't recall seeing many Storms, or for that matter, much destruction. Oh, wait, there is some of that. There's also a lot of mighty fast futuristic cars, smooth scrolling and nasty jumps. So ignore the title, it's crap. Instead concentrate on a mightily addictive game, if a little frustrating. I don't know what the plot is, but it's irrelevant anyway. Basically you're in some kind of race, with limited fuel, and you must race to the end of each course as fast as you can. You must avoid, or jump on, opposing cars, there's one particularly nasty computer-controlled car that does its best to stop you. There's also "Frogs", which cling to the back of your car and slow you down, flicking your car left and right will shake them off. The roads aren't great, with massive gaps in places, so you'll have to jump them, and occasionally collect either fuel, temporary shields or points to try to prolong your progress. Alright, it's a bit quiet on the roads, clearly they thought sound might be asking too much, but it doesn't matter. 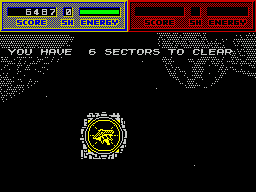 Impossible Mission II has so little sound they needn't have bothered, and that works, so why shouldn't this? OK, so I never got past the "Big Cave Tunnel" level. But I tried and tried and tried, which must say something for the quality of this game. It's the speed more than anything, and even if you can only clear the first 3 levels like what I could, they're nice long, challenging levels, and fun to play. Thunder Blade was Sega's helicopter-based version of After Burner. That is, it was a shoot 'em-up, mainly played in 3D (but with 2D sections too), often delving into what can only be described as "Bullet Hell". 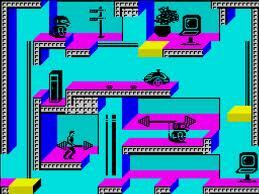 That said, it was a decent enough game, often available in sit-down hydraulic cabs and featuring oversize joysticks. Which is where everything goes wrong for the Spectrum version. You see, you need to be able to adjust your height and move left and right... as well as accelerate and slow down. Unfortunately, having a single joystick makes this a bit of a challenge to implement. Obvious answer? Define a couple of keys on the keyboard to take care of either the height or the speed. Actual answer? How about to speed up, you have to hold down the fire button and move the joystick up and down? 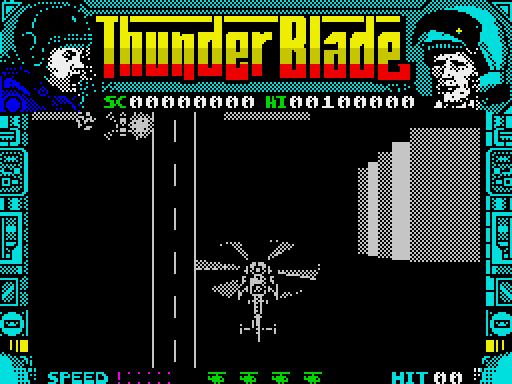 So, while you're accelerating, you can't shoot back at the enemy, OR change your height; The agility of your futuristic chopper gunship has just been slashed... As have the odds of you reaching the end of level 1. Sorry, but they ruined the game with this decision. Having said that, the slowdown rate when there's enemies on screen doesn't help either. 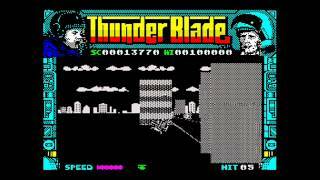 Shame, really, as the graphics are really quite good, this game could have been pretty special, unfortunately the cumbersome and ineffective controls just spoilt the whole thing. Winners... don't use drugs. Oh, wait, sorry, that was William S Sessions' famous words appearing on practically every 90's arcade game ever. Winners... on the Spectrum, at least, was a decent compilation. Taking 3 hit games and 2 duffers for the price of 1 and a half full-price Spectrum Games, it really was a no-brainer. Oh, yes. Yeah, hindsight is a wonderful thing and all, so how about you just check out Impy Mish II, LED Storm and Blasteroids, and leave the rest to fester? 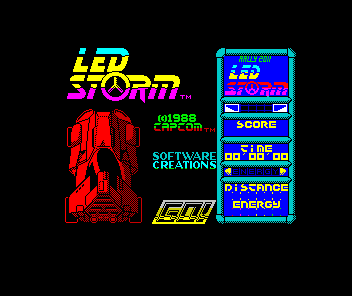 Saying that, Impy Mish and Blasteroids are freely available on World Of Spectrum, LED Storm currently sits as "Distribution Denied" as Capcom do not allow the free distribution of their copyright... but I'm sure with a bit of hunting you'll find a copy on Ebay.